Even my mathematically challenged brain can do the high-school geometry: A pizza’s area is calculated by multiplying pi by the square of its radius. The radius is half the diameter. (See the calculation above.) Ergo—and here’s where I picture myself in a pizza-related sequel to A Beautiful Mind—sharing a large pizza with a friend rather than each getting an individual small pie yields 14 more square inches of pizza for each of you. Beautiful. Thank you, Fernat’s Library, whoever you are. Now, there are some considerations to take into account before we declare the large-shared-pizza option objectively superior to individual pizzas. 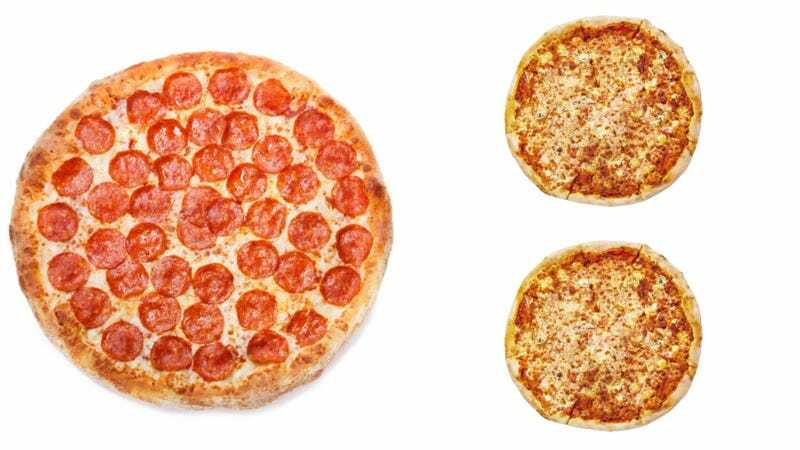 Namely, the two small pizzas yield more crust: Using a calculation to find the pizzas’ circumference (circumference is pi times twice the radius), we find that ordering two small pizzas results in 18.85 more inches of crust, or 9.425 inches more crust per person. Is 9.425 crust-inches > 14 square interior-inches? Only you can know that, deep in your heart of hearts of pizza preferences.